For its inaugural exhibition, Junior Projects Gallery is having a group show titled “it’s a poor craftsman who blames his tools”, which features work that are handmade. Each piece shows the hand of the artist but still preserves precision either of form or content. 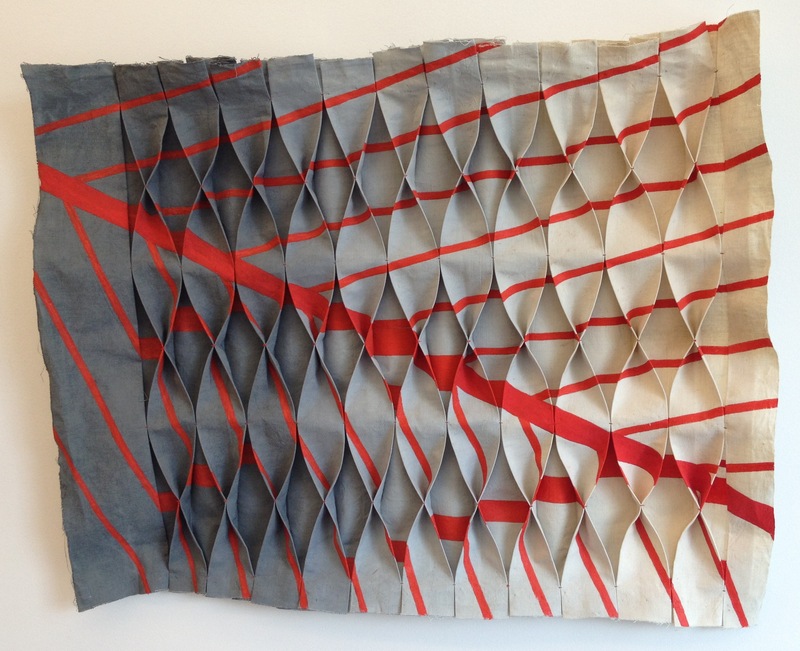 On display is the work of Megan Cotts whose work is both mathematical as well as historically biographical. Cotts great-great grandfather designed intricate paper decorations in Germany during the early 20th Century. His work included the development of the system to create the honey comb type of paper structures we still see today, like the paper pumpkin I have that folds flat and then at Halloween opens up to make a round 3D pumpkin. The designs and patents were lost to the family during the tragedy of the Holocaust. The designs were used by others for architectural and industrial purposes. The original paper products were machine made, but Cotts hand stitches fabric to recreate the folded forms. The titles of these works are the original German patent numbers for the designs. In “DE426689A Fig.3”, ten box pleats of folded linen are stitched at five even intervals. The top and bottom two intervals just attach adjacent strips together.The middle set of stitches pinch the strips in half, revealing a background linen canvas and creating an interesting elongated diamond pattern. Both the folded strips and the background are painted in horizontal stripes.The viewer is aware that this is a hand made work but there is an exactitude to the structure so the under lying mathematics is still visible. Cotts’ “DE426689A Fig.2” seems to be made by first creating 11 vertical box pleats. Then, the folded strips are pinched three times each, creating an undulating wave pattern. There is a branch-like painted pattern that is slightly distorted by the pleats and pinches. 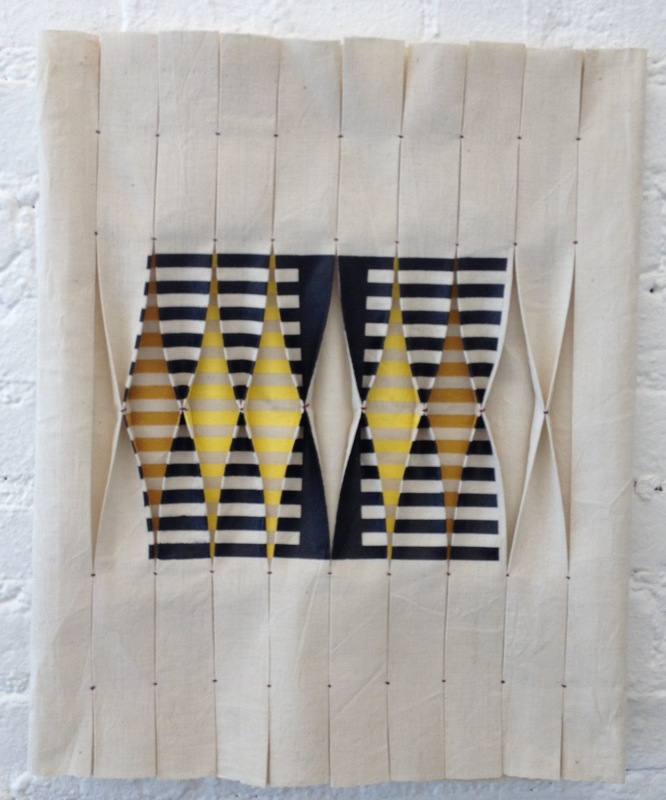 In making this work the artist is using the visual language of mathematics: lines, divisions, numbers, curves and a process of handwork, fold, stitch, paint, and creating a moving expression of the design heritage of her family.